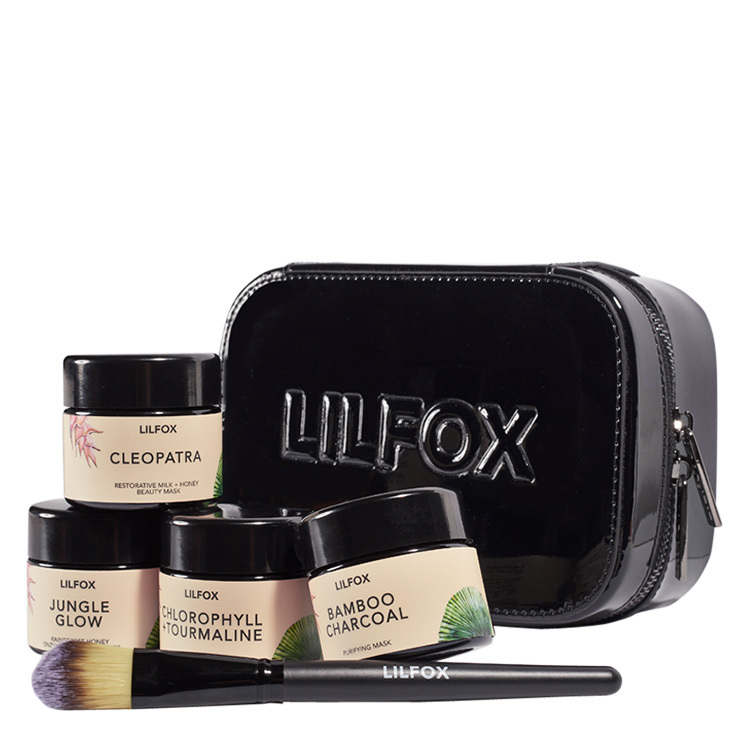 Round out your beauty routine with LILFOX Radiant Fox Rainbow Mask Set. This indulgent set includes 4 beautiful skin essentials to keep skin happy and looking its best. Jungle Glow Enzyme Cleanser + Mask cleanses away dirt and impurities and leaves skin looking plumped, clear, and glowing with raw honey and passionfruit oil. Chlorophyll + Tourmaline Brightening Mask makes skin feel purified and refreshed with spirulina and matcha green tea. Bamboo Charcoal Purifying Mask lends a calming and smoothing feel to skin with raw cocoa and lavender. Cleopatra Restorative Milk + Honey Beauty Mask feels gentle on skin while it softens with coconut milk and rose petals. Choose a mask to address specific skin issues or as a treat for skin. Choose a mask to address a specific skin issue or to amp up your daily regimen. All of the masks in this collection leave skin feeling soft, smooth, and cleansed. Jungle Glow Enzyme Cleanser + Mask creates a clear and balanced appearance, perfect for times of breakouts or when skin needs a boost of glow. Use Chlorophyll + Tourmaline Brightening Mask when you crave the feel of deep down cleansing and detoxification. Employ the benefits of Bamboo Charcoal Purifying Mask when skin feels irritated or stressed. Cleopatra Restorative Milk + Honey Beauty Mask is ideal for improving the appearance of firmness, dark spots, and wrinkles. To use, mix mask with water or floral water in a bowl and apply to skin with the Vegan/Cruelty Free Taklon Bristle Mask Brush, included in the set, and allow to remain on skin for 20-40 minutes. Remove with a warm wet cloth. All items may be conveniently stowed in the Luxury Vegan Patent Leather Beauty Case.